This document is organised into the following sections. Document on the name Hinchliffe? "Or, A wivern between Three Fleurs-de-lis vert"
When translated the blazon also describes the original colours of the Hinchliffe Arms as "Gold; A Green Wivern Between Three Green Fleurs-de-lis"
The following document was purchase by my Grandfather Hubert Hinchliffe (b 28th January 1899 in Dunsley, Holmfirth) when the author sent out copies to Hinchliffe's in the Local area or possibly because he answered a newspaper add. The document cost about £2 at the time. I have since been in touch with the Author and although he holds the copyright he isn't too concerned that I have put it on the Internet. Apparently he has had people trying to sell him photocopies of his on Papers! 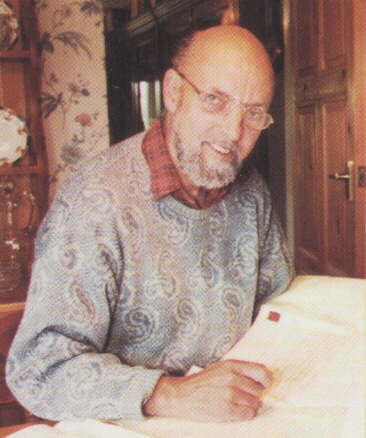 I have recently bought a couple of books off George and on one phone call he mentioned that he had been working with someone who has been checking DNA. Apparently names with a one location source tend to have a lot of similarities in there DNA. And checks on Hinchliffe's have confirmed we are from one location. These is are very useful guides to the origins of a lot of Surnames of Yorkshire Origin Each Surname gets about 1/5th of a A5 page and contains early examples of each name. EG 1545 William Hynchclyff (Holmfirth) (That's not the earliest but if you are interested you will have to buy the Huddersfield book. The George has slightly updated the details in the following report too. This is a book about how surnames in general have changed in spelling due to Linguistic Development and clerk error. George Suspects he has details of about 50 Hinchliffe's from Court Records he has researched. This would cost £25 to obtain. I am still thinking of these and I won't be revealing them if I do get them as this is how George earns his money. Even at the present day the main home of this prolific family name is the southern half of the West Riding and many scores of families still live in and around those Holme Valley hamlets where the surname was first recorded 650 years ago. Although the surname is now so well known this was not always the case and all the evidence points to a single family origin in the West Riding. Even as late as 1545 the only three families recorded in the subsidy roll for the Clothing Area lived in or near Holmfirth. This is all the more remarkable if we consider that included in this area were Bradford, Leeds, Halifax, Huddersfield, Wakefield and Dewsbury, not to mention a score of minor towns. In all these places variants of Hinchliffe can now be found, often in good numbers, but the surname's expansion there is relatively recent. This should not be taken to mean that the Holme Valley was the only place where Hinchliffe could be found in 1545. The area in which the family had its origin and early history lies close to the watershed of the River Dearne and at a very early date migration took place over the watershed and as far south as Sheffield. Consequently much of the name's ramification over the centuries has been in the villages of Staincross Wapentake and in towns such as Penistone and Barnsley. Sheffield has, throughout most of its history, been an important centre of its distribution. Hinchliffe is geographical in origin and two minor place-names should be considered when we try to locate the source. There is, for example, a Hingcliff Scar in Bradfield in the South Yorkshire Pennines. Unfortunately there are very few references to this place and none at all before 1440. It might conceivably be the source of the family name but a much stronger case can be made out for the locality now known as Hinchliffe Mill. References which point to this place-name 'certainly pre-date the first surname evidence, e.g. 1307 John, son of Hugh, gives 2 shillings for 2 1/4 acres at Welesbothem, and 3 roods at Heyncheclyf. As this was recorded in the court rolls for the village of Holme it would certainly seem to refer to what is now called Hinchliffe Mill. In one sense, however, indecision about which place-name gave rise to the surname is not very important, for both have the same meaning. The words 'henge-clif' in Old English signified a steep slope or cliff, a description which in fact fits both the localities we have discussed. Whilst the tendency to omit the initial 'H' produced numerous variants, e.g. Most of these varying forms were attempts by clerks to render in writing what they heard, what they thought they heard or what they thought the "correct" form was. In the Protestation Returns for 1641 the name in the Holme Valley was always Hinchliffe; a generation later in the Hearth Tax Hinscliffe prevailed, although there was one Hinchliffe and one Hincliffe. Over in the next valley there were Hinchcliffes at Longwood and Quarmby. It is quite likely that an even more exhaustive search of surname lists, both in this country and overseas, will widen the range of variants and also produce hybrids where Hinchliffe has developed alongside similar names such as Hinckley. 1324 Thomas, son of John de Hengeclif sues John son of Hugh de Alstanley (Austonley) for trespass. In the next few years the name of this man appears in the manor rolls for Holme on a number of occasions, e.g. 1325 Thomas de Hyengeclif surrenders 8 acres in Holme, committed to William de Hyengeclif - 2 shillings. 1331 Thomas de Hiengecliff stood surety for Thomas Undirlangley who was accused of chasing Robert Chobard's cattle with his dogs. The only other member of the family mentioned at this period is a woman, who may well have been the widow of the John referred to. There is, however, nothing to show the exact relationship. 1324-27 Agnes de Hyengeclif / Hengeklif / Hingecliff or Hyngecliff fined for various minor offences, i.e. for allowing her beasts to escape (3 pence) and for helping herself to wood from the Earl's forest (21 pence). Inevitably many family names of this type disappeared in the Middle Ages and one of the main causes was undoubtedly the disastrous plague of 1349-50, known as the Black Death. The Hinchliffes not only survived this calamity but as the Poll Tax of 1379 shows, had actually ramified in the meantime. John de Hyncheclyff and wife. 4 pence tax. William de Hynchecliff and wife. 4 pence tax. Richard de Hynchecliff and wife. 4 pence tax. Adam de Hyncheclyf, a single man. 4 pence tax. The standard rate of tax was 4 pence and only tradesmen or gentry paid more. It seems unlikely, therefore, that the Hinchliffes of this period had any special status in the enclosed world of the Holme Valley. 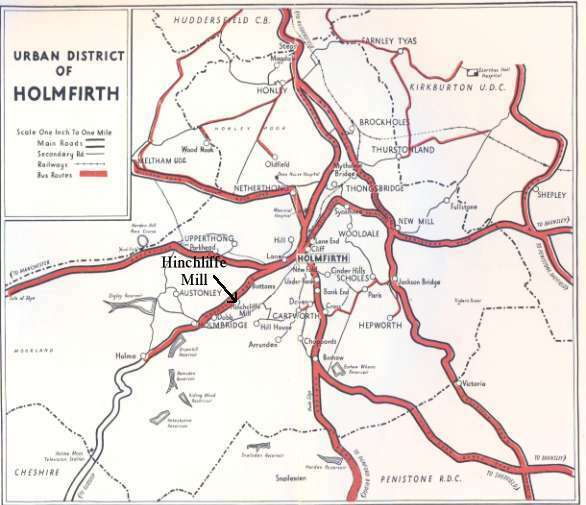 What is of interest is the fact that several widespread hamlets were listed under the general heading of Holmfirth and there is no way of knowing exactly where the three Hinchliffes lived. The bridge at Holme actually divided the two great parishes of Almondbury and Kirkburton, although the tendency for at least 300 years was to move south and east rather than north and west. In the period 1379-1545 the population did not increase greatly and it is not very surprising, therefore, that the surname Hinchliffe was no more numerous in the 16th century subsidy rolls than in the great Poll Tax of 1379. The period between these great nationally levied taxes was one of political confusion and civil strife, and ironically the documentary evidence for yeoman families is often much less detailed than in previous centuries. Enough survives, however, to show us that the Hinchliffes continued to live, generation after generation, in the same area, e.g. 1437 William Hynchclyffe of Scholes quitclaimed certain lands to Adam de Stokkes (probably living in Thurstonland). 1524 Thomas Hynchlyff of the Crosse, taxed 12 pence on lands valued at 20 shillings. Robert Hynchclyffe, taxed 12 pence on goods valued at 40 shillings. Both these men were again listed under 'Holmfirth' but we know from a will proved in 1526 that John Hynchclif lived at Cartworth and from a second in 1541 that another John Hyncheclif lived at Holme. In the second subsidy roll four years later there were still only three members of the family in the Clothing Area, all in Holmfirth. l636 James Waterhouse of Holmfirth, a clothier, stole one lamb, value 2s.6d, from James Hinchcliffe. 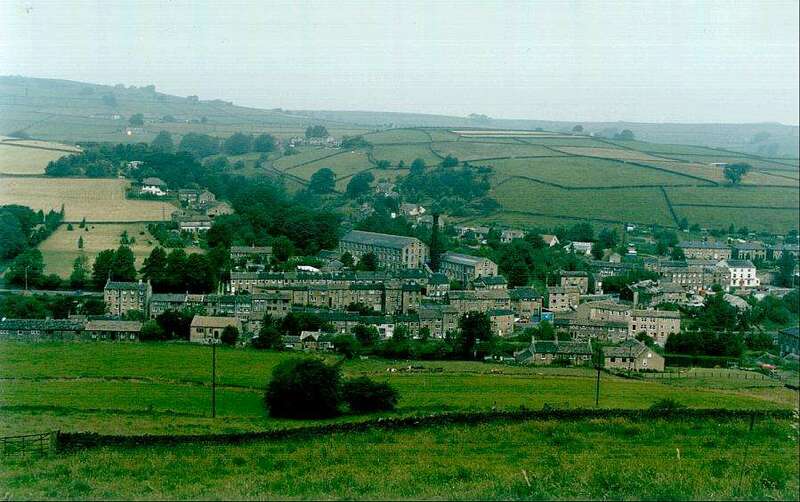 1658 Ambrose Hinchclyffe of Holmfirth, a carpenter, stole two ewes value 10 shillings from Francis Haighe of Penistone. Austonley (11), Cartworth (9), Holme (7), Hepworth (5) and Wooldale (3). All these men lived within a mile or two of their ancestors of the 1320s and many other families had not moved far afield, e.g. Fulstone (3), Meltham (3), Upperthong (2). Isolated Hinchliffes lived in Kirkburton, Thurstonland, Lepton, Longwood and Marsden. There is actually a surviving rental of Wakefield manor for the year 1709 which identifies in detail the land holdings of many of these Holme Valley Hinchliffes. It would be tedious to list them all but as an example we can cite James Hincliffe (sic) who paid 1 shilling for 'Good Greave' and 7 shillings and sixpence for land at 'Arunden'. He, or a namesake also held tenancies at 'Maukin House, Dunsley, Austonley, Doxon Shaw and Knowle'. Actually at this time James was not a commonly used name in the Hinchliffe family and the main ones were John, Thomas, Abraham, Richard and Henry. Others in frequent use were Joseph, Edmond, Francis, Ralph and George. 1430 William Hynchcliff of Woolley was bequeathed 20s in the will of Oliver Woderow. 1440 John Hyncheclyf of Sheffield (Manor Court Rolls). 1472 Grant by John Wombwell esq. of lands in Wath, Melton and Brampton which Thomas Hynchcliffe of South Kirby had granted him. All these families appear to have had descendants for the surname continued there for many generations. There are wills registered for the Hinchliffes of South Kirby in 1474, 1546 and 1556 and in both Woolley and Sheffield a variety of documentary evidence throws light on successive generations of the family. 1467-8 Quit claim by Thomas Gaunte of Hoyland Swayne to Richard Wentworth of Bretton Hall. Witness William Hyncheclyffe of Woolley. 1489 Grant by Robert Rilston to Thomas Popeley of Woolley of a yearly rent of 3s,4d. Witnesses William Hynchclyff, Matthew Wentworth. 1511 Grant by Thomas Wentworth of West Bretton esq. of lands and messuages in the tenure of William Hynchclyff. 1546 At the break up of Monk Bretton Priory the library, which was a very fine one, was sold to the monks. One of the main purchasers was Richard Hynchclyff alias Woolley! Perhaps he was the Richard who in 1559 was described as a priest and bought lands in Worsborough. 1591-2 Francis Hynchecliffe of Woolley sold lands to George Brownell. 1615 Will of Francis Hinchcliffe of Woolley registered at York. Even before the end of the 17th century the surname ramified prodigiously in this area to the south of the Holme valley and one or two further extracts from documentary sources seem worth quoting, e.g. In the year l898 there was printed for private circulation a number of notes on the Hinchliffe family. They were edited by O. Hinchliffe and published by Hinchliffe & Co. of Manchester. For the most part the references are to isolated members of the family who either lived outside Yorkshire or who achieved distinction in some way, e.g. Dr. John Hinchliffe, Bishop of Peterborough; Messrs Hinchliffe & Co. of Whitelands, Chelsea, Wall Paper Manufacturers; John Elley Hinchliffe the gifted sculptor and his son John James an engraver, etc. There is also however some interesting information on the surname in the Penistone area. There was, for example, a set of trustees appointed by the King in 1677 to regulate the management of the endowed lands of Penistone Grammar School. At that time an Arthur Hinchliffe was one of the trustees and in 1898 John Hinchliffe of Bullhouse Hall, Thurlstone was still carrying on the traditional office. In a reference to a great lawsuit over lands in Penistone carried out in 1595 between the Wortleys and other landowners a William Hinchliffe was mentioned, so the history of the name there clearly goes back nearly 400 years at least. Other paragraphs deal with the Hinchliffe Charity, based on a gift of lands at Wombwell and the various residences of the family at Pawhill, Cross Royd Head, Billcliffe and Hartcliffe, all within 3 miles of Penistone on the edge of the moor and mentioned in the Diary of Adam Eyre of Hazlehead, a Captain in the Parliamentary Army, written in 1645-7. 1483/4 Henry Hinchclyff surrenders a messuage and land called Birley Hollins to the use of Nicholas Mounteney, esq. 1564 It was presented that the wife of Robert Hynchecliff has brewed ale and sold it contrary to the assize. 1593 Thomas Skynner surrendered lands and tenements in Stannington to the use of Henry Hinchcliff, his heirs and assigns for ever. 1625 William Hinchclyffe, juror at the manor court. Throughout the latter part of this period the Hinchliffes were engaged in a number of land deals - often having their name linked with that of the Littlewoods, another Holme Valley family. In 1580, for example, the Henry referred to above bought lands in Stannington, Ughill and Oakes and five years later in Dungworth and Woodhouse. In Sheffield, perhaps more than elsewhere, the variety of occupations followed by members of the family was very wide. Whereas in the Holme Valley farming or the making of cloth were usual, in Stannington and Ecclesfield we find: 1590 Thomas Hinchliff, cooper; 1617 Henry Hinchcliffe, waller; William Hinchliffe, blacksmith. 1718 Edward Henchcliffe, goaler (sic). 1649 Abraham Hinchliffe of Burley in Wharfedale "saith that he was never sequestered nor questioned for any delinquency nor engaged at all in the latter war........but taking notice of the favour intended by the late votes of Parliament to such as shall discover themselves, he is seised of land in Burley; lease of a farm called Kirkstall Grange, of 2 water mills and 2 fulling mills and lands in Kirkstall and Bramley worth yearly £74, of a lease for 7 years of Abbey lands etc, possessed of cattle and household stuff worth £14 etc." Clearly the Hinchliffes of Kirkstall had become a wealthy family in Lower Wharfedale and it is not surprising to learn that in 1664 Eleanor Hinchliffe of Kirkstall married into the even more famous family of Fairfax. Although the early history of this surname suggests a single family origin it had become very numerous by 1650 and widely dispersed. I find Hinchliffes in Nottinghamshire from 1550 and in London from c.1675 and doubtless other branches had settled elsewhere. Despite this migration, however, the Holme Valley has not ceased to be the place where the concentration of Hinchliffes is most marked and in conclusion I should like to give some idea of this from recent records. Although such a Directory covers a proportion of the population only, there were over 20 Hinchliffes listed, the majority in the town of Holmfirth itself (9) but others in traditional locations: Austonley (2), Cartworth (2), Upperthong (5), Wooldale (3), Fulstone (2) and Hepworth (2). Many of the names common in 1641 were still being used, e.g. John (3), Thomas (2), Henry (2), Joseph (3) and George (2) What is also noticeable is the 19th century habit of using the wife's or mother's maiden name as a christian name. Johnson Hinchliffe (grocer), Parker Hinchliffe (sizing boiler). Not surprisingly farming and the woollen trade occupied many of the family at this time as they had for hundreds of years, but the range of occupations is very wide. In addition to those mentioned there was a chandler, two innkeepers, a postmaster, a wheelwright, a shoemaker, a joiner and even an 'aerated water manufacturer'. In the area covered by this Register for Holmfirth, no fewer than 92 householders called Hinchliffe are listed. 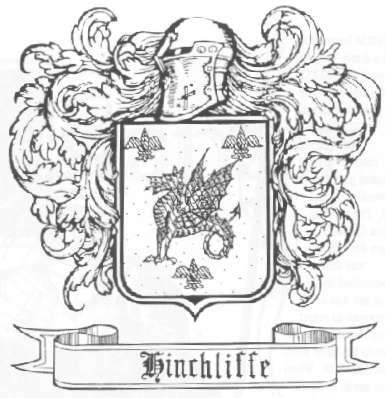 There is also one Hinchliff and furthermore, Hinchliffe is found as a christian name. This statistical evidence merely confirms what any resident of the Holme Valley takes for granted, or what any visitor might deduce if he notices the names on shops and mills. What is, perhaps, new in the Register is the evidence of a complete break with the traditional christian naming pattern. Although there is an occasional George, Joseph and Thomas and as many as four Johns and two James, the most popular names are Brian (7), Harry (5) and Harold (5). Fred and Albert are just as numerous as John (4) and the next group consists of Frank, Norman, Ronald and Robert (all 3). � 2014 Jon Hinchliffe. E-mails welcome!